It doesn’t measure what people actually pick up; and it only includes paid media, such as TV advertising and outdoor. It doesn’t cover earned, owned and environmental media. Is there a measure of brand pickup that gives a fuller picture? 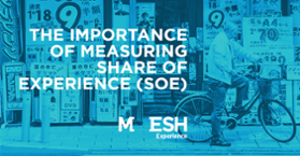 We have investigated a new metric – share of experience (SOE) – to see how this can help marketers. Share of experience is the percentage of total brand experiences that a brand has in relation to the total market. So if we are looking at airline brands, we might see that Delta Air Lines has 30% SOE, meaning that it has 30% of all experiences that people have with airlines. and learn how this new metric could unlock growth for your brand. Download the full report for FREE!